The Cologne Opera offers productions that are outstanding for their music and staging. Famous singers and conductors are linked with the history of this opera house, whose artistic renown has been highlighted by major premieres such as “Bluthochzeit” by Wolfgang Fortner and “Die Soldaten” by Bernd Alois Zimmermann. There is seating for more than 1,300 people in the opera house on the Offenbachplatz square, which was designed by the architect Wilhelm Riphahn. Its purist elegance has provided a worthy setting for opera evenings in the cathedral city on the Rhine since 1957. The consistently excellent quality is ensured by the Gürzenich Orchestra of Cologne, which is currently led by General Music Director Markus Stenz. 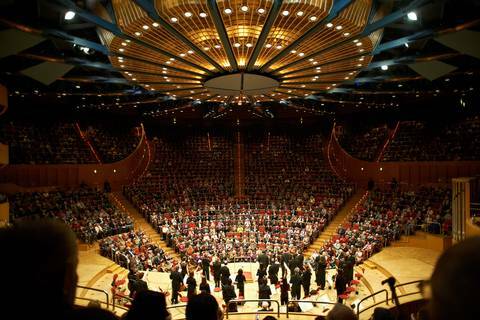 Since 1986 the Kölner Philharmonie has been an integral part of Europe's music scene. One reason for such prominence is the variety of the concert programmes, which comprise the great works of the symphonic and chamber music repertoire, jazz sessions, folk and pop events, and the world and Cologne premiéres of lesser known, new and exotic works. Another reason is the unique atmosphere prevailing in the exquisitely beautiful concert hall which has been designed in the style of an amphitheatre. Concerts are held almost daily here and up to two or three on Sundays and public holidays. The LANXESS arena is Europe's biggest and most modern multifunctional arena. Situated in the heart of Cologne, Germany's media capital in the River Rhine Valley, the LANXESS arena offers a new dimension for indoor events. The arena with its façade of 8000 square meters of glass is spanned by a steel arc 76 meters high and seats up to 18000 visitors, a capacity that is unique in Germany and the rest of Europe. But it's not only its size that makes the LANXESS arena one of the most attractive locations for international shows and concerts. State-of-the-art stage equipment, a height-adjustable video cube and a multifunctional interior level further distinguishes this exceptional arena. International top stars including Anna Netrebko, Rod Stewart, Kylie Minogue, Paul McCartney, Sting, Whitney Houston, Eric Clapton and Luciano Pavarotti have made the LANXESS arena their own. So have popular entertainment shows like Holiday on Ice, Best of Musical, Carmen, Nabucco, Riverdance and Lord of the Dance. Thanks to its all-purpose features, the LANXESS arena is also well equipped to host some of the most spectacular sports events. Highlights include the Ice Hockey World Championship 2001, the Olympia 2004 preparation games of the US basketball Team, the World Cup of Hockey, as well as regular season games held by local ice hockey-, basketball- and handball teams that long have made Cologne a centre of diverse sports entertainment. Cologne has various Cinemas, each one with it's own characteristics. The cinedome is the biggest Cinema in Cologne, located at the Mediapark. Opened in 1992, the Cindedome offers 3748 seats and 14 screens, each one equipped with up to 40 speakers. Most of Holiwood's productions are on screen here, some of them in Original without being dubbed. The metropolis theatre is more of an programm cinema, showing movies beside the block buster production. Most of them are shown in english (with/and without subtitles). The Odeon Cinema, The Rex am Ring, and the Filmpalette are also small beautiful nostalgic cinematographic theatres. At the OFF broadway, international movies in original recordings are shown. The Astor Film lounge Residenz is a very special and beautiful nostalgic cinema. It shows only a few movies, but in a amazing atmosphere, providing drinks and food during the preprogramm for their guest, who are saeted in enormous and very comfortable lether seats, where you can even lay down!